The U-14 women’s football team from Jharkhand, called Yuwa, has won the third position in the Gasteiz Cup held in Spain. They were placed third out of ten teams in the girls’ category with two wins and two losses and a draw. They also took part in the Donosti Cup in San Sebastian, which is regarded as one of Spain’s most prestigious tournaments, with over 400 teams participating from all around the world. The team made it to the group phase before being knocked out by Santa Teresa of Spain. The team also made a visit to the Estadio Santiago Bernabeu Stadium on July 7, which is home to 9-times Champions League winners Real Madrid. The team consisted of tribal girls from Jharkhand who were trained in football by the NGO Yuwa, with most of them being victims of child marriage and human trafficking. Yuwa worked to provide them with new opportunities through sports and education. The girls were humiliated, slapped and forced to sweep floors when they went to the Panchayat Office to get their birth certificates for their passports. 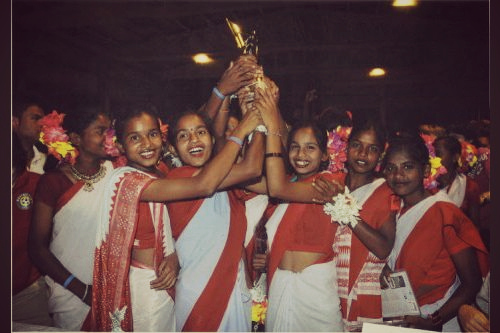 “We could not sleep that night (when we came third in the tournament)” says Rinky Kumari, one of the girls.